Whether you are training for a 5K or marathon treat yourself to new gear, it’s time to start logging some miles and looking good doing it! Last year's apparel looking worn? Smelly? Here are some of this season's trends. Start with the correct foundation - a new running bra. There are so many choices this season, fun colors and prints! Options are available in racer back, traditional closing, convertible straps and over the head. Start with a professional bra fitting, they can fit you properly and guide you to the best bra for you to save time, frustration and money. The season's new pant length is a 7/8" tight to hit just above the ankle. This is a great length to wear for yoga, as part of a lifestyle collection or for running - this length looks less "athletic" so it can crossover to anything in your lifestyle. We are loving the tights and capris that can hold your phone in a side pocket, convenient for music or stopping to take a selfie! If you have been wearing black bottoms, this is your season to try something new with pattern. We are seeing over over patterns (or allover patterns) as well as placement pattern for the less daring. We know Mom told you never to do this, but mixing pattern is happening in the apparel industry. Try it - you will have some great race photos! If you have steered away from tanks, this is your season with many choices of colors and styles. Traditional racer back tanks, open crossover back, high neck tanks and double layers (two shirts in one) are popular. I am loving styles that are longer in the back for additional coverage and tops with strategic seaming for a flattering look. The newest look in men's running gear is the capri tight under your running shorts. This keeps your legs warm and looks so cool! Placement print is also happening in men’s shorts, available unlined to wear with compression shorts or running underwear. Shorts are available in so many lengths, from 3" split to 9" unlined. You should have a variety of short lengths in your wardrobe to vary for race day and training to strength workouts. While black is still the most popular color, there are some awesome new blues, stripes and bright colors! Running tops have remained classic but fabrication, color and details are new this season. The racing singlet has been updated in light weight fabric with placement striping. 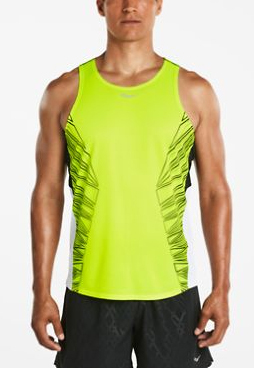 Running shirts have subtle striping and reflective trim. Many are less boxy and come in great colors! Even compression is in the fashion game with great colors to coordinate. Did I mention socks? It is time to update the sock collection. New lightweight socks with just the right amount of cushioning where you want it - heels and toes. Go for color and prints in socks too! New to trail running? Join us for the “Trails ’N Ales" training series hosted with our partners at soundRUNNER. Learn the basics of trail running technique and all about trail shoes, and take a guided run around Gay City State Park to get a feel for the Summer Solstice Trail Run 5.5 mile race course (June 18 race). The series runs May 23, 30 and June 6, 13 - it’s free but you must reserve your space by signing up here. Shoe demos and ales provided by On Running and Altra Zero Drop. Trail running is a common getaway for runners who don't want to deal with the usual inconveniences of the road, whether it's the traffic, the noise, the straight lines, or the specific view of turns ahead on the road that taunt you. Whatever your reasons, you can find mental and often physical salvation on the miles and miles of trails that this fine state has to offer. There are some benefits of trail running that may also help save your summer goals from being sidelined by injury. The trails require runners to watch every step through the varying the terrain, helping runners avoid many of the overuse issues that can happen with road running. Changing the running surface to something a little softer can take away some problems associated with constant runs on the cambered road, which is a very common cause of hip problems. Runners also get the chance to strengthen tertiary muscles that help you balance and increase running efficiency. Another benefit to trail running is in what you’re breathing. The air quality on trails is almost always going to be better since you aren't dealing with exhaust fumes of passing cars or the rising heat and other gasses from the pavement itself. Especially in the summer, when the extra pavement radiation adds a good 10 degrees to the air around you. If you're a trail in an area with rivers or a reservoir, you will even get the occasionally refreshing patch of really chilled air, which just feels fantastic! Trails are also good practice with hills, since you're dealing with natural uphills, rather than the more gradual, longer hills of a paved road. They are enough to get the leg muscles working, but not so arduously long to make you miserable like a road hill. After some time on the trails, no road terrain will intimidate you! Whether training for a road race, or just trying to stay healthy, trail running at least once a week will be sure to help break up the monotony of constant road running.